If you ever used a public system, you might have seen that you are prevented from using specific key combinations which can invoke OS related processes giving access to system related information.For ex. 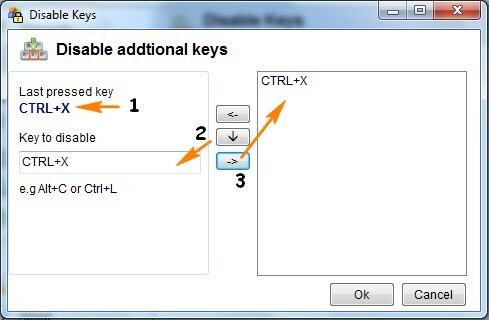 Ctrl+Shift+Esc invokes the Windows Task Manager, using which running background processes can be closed, or new processes can be started.If you wanted to prevent use of such key combinations, then here’s a very easy way to do it.dWinlock is simple to use app which lets the system admin block specific key combinations and prevent key based invocation of applications.It also comes with an option to set a password, so that the options cannot be changed.It can also be set to run in the background invisibly and the GUI visible only with a specific key combination. 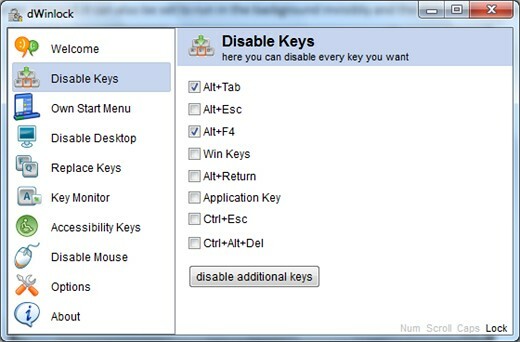 Start the application and the navigation bar to the left has the various sections under which different key combinations can be blocked.For example, in the Disable Key Section, select the default key combination that you want to block.Once the key combination is checked, the result is real time and the key combination is available instantly. How To Disable Copy Paste, Cut, Move, Delete, Rename, Move To, Send To, Copy To, and Task Manager In Windows. If you have a key combination that is not listed by default and you want to block it then use the “ Disable Additional Keys ” button to register custom key combinations to block.Next a new popup window opens like the one shown below. Now press the key combination ex. ( Ctrl+X) that you would like to block, next press the Down Arrow Button highlighted which should bring the key combination copied into the Key to disable text box ( Ctrl+X) , next click the right arrow key to add the list (Ctrl+X).Click OK to block the custom key combination. A custom Start Menu can also be created replacing the Windows default Start Menu, by adding Applications of one own choice to the list. 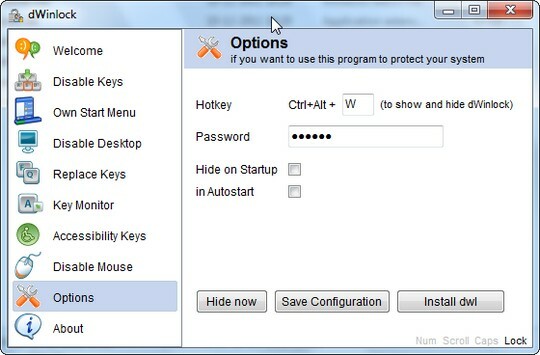 A password can be set in the Options, along with options to hide, AutoStart and Run dWinLock silently in the background ( The default key combination to call dWinlock is [ Ctrl+Alt+W ] ).In the event a user accidently presses the key combination to show the dWinLock Window, the password is ask for to prevent unauthorized changes to the application. The best part is that this application does not require any installations and runs out of the box, Download and Extract the files and start dWinlockDemo.exe and it is also compatible with Windows OS.